FAYETTEVILLE, Ga. -- Fayetteville police arrested a man they say entered into restricted areas of three metro Atlanta hospitals and stole prescriptions. According to Lt. Mike Whitlow of the Fayetteville Police Department, Grant Christopher Allison, 43, is charged with two counts of burglary for separate incidents at Piedmont-Fayette Hospital on Oct. 6 and Oct. 10. Police said that Allison walked into the restricted areas wearing a fake employee badge and took prescriptions from computer terminals. Allison then allegedly filled the prescriptions at area pharmacies. Authorities said they seized evidence during a search of Allison's home. Allison was taken into custody without incident on Wednesday. The 21-year-old Honor Roll student at Georgia State has never had trouble with the law before. He thought he would get a ticket and move on. "The officer said 'did you know your license was suspended?' I said no," Marcus said. The officer told him he had a suspended license out of Macon. "I haven't been to Macon in three years," Marcus said. But he has been driving on a suspended license for the last year. For a crime he didn't commit. Marcus gave 11Alive'sRyan Kruger the citation that's on his record with the Department of Driver Services. The name Gerien Marcus was confused for Marcus Green. FAYETTE COUNTY, Ga. -- A 96-year-old man was brought to tears by the kind actions of a hospital worker. Tom and Arnisteen Clark have been married for 68 years. The only time the Fayette County couple were apart was when Tom was stationed in Korea while serving in the Army, so it was difficult when the two were forced to stay in separate rooms after they checked in Piedmont Fayette Hospital. The two are staying on an orthopedic floor, in which all the rooms are private. It is against state regulations to put two patients in a private room, according to Charlsie Niemiec of Piedmont Fayette Hospital. Tina Mann, the a manager at the hospital, went out of her way to make sure that Tom, 96, could visit his 92-year-old wife in her room several times a day. "I just can't be away from her, she's the finest woman in the world," Tom Clark said. 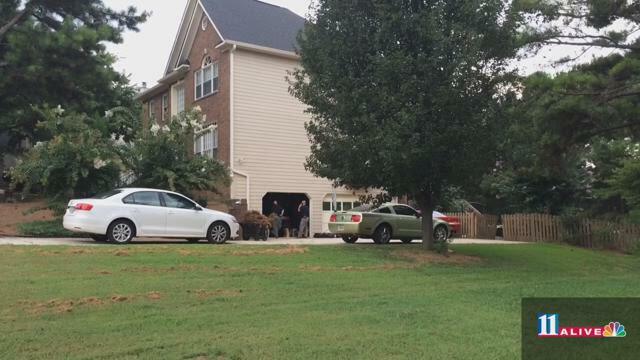 FAYETTEVILLE, Ga. -- A man shot an alleged home intruder four times in Fayetteville on Thursday. 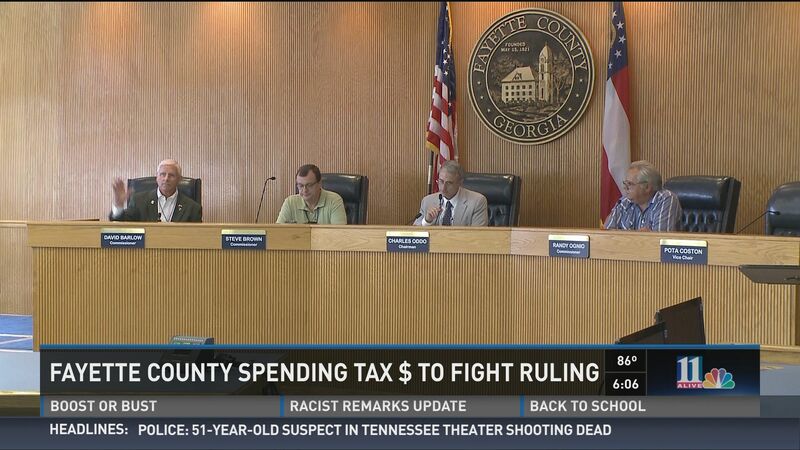 FAYETTE COUNTY, Ga. -- An intense legal battle is costing taxpayers in Fayette County around a million dollars - and it's far from over. The case stems from the seat vacated by Pota Coston who lost her battle with breast cancer. ATLANTA -- A federal judge has just ruled that the election to replace a Fayette County commissioner will be decided by those in her district. Pota Coston was elected in 2014 – the first black elected official in Fayette County's history. This was, many said, in large part due to a judge's decision to force districts within the county to vote for their own commissioners. The judge, at the time, said the decision would give voices to under-represented communities, namely the black community, which makes up 21% of Fayette County. FAYETTEVILLE, Ga. -- Pota Coston was the first African American elected to the Fayette County Commission. Her battle with cancer began the same month she took office this year. She died on Friday. As the county looks ahead some worry about how she will be replaced. At the first meeting since her death, neighbors are worried the new found diversity they've seen on the commission will die with her. They even went so far to declare how she'll be replaced "unfair" and "potentially discriminatory." 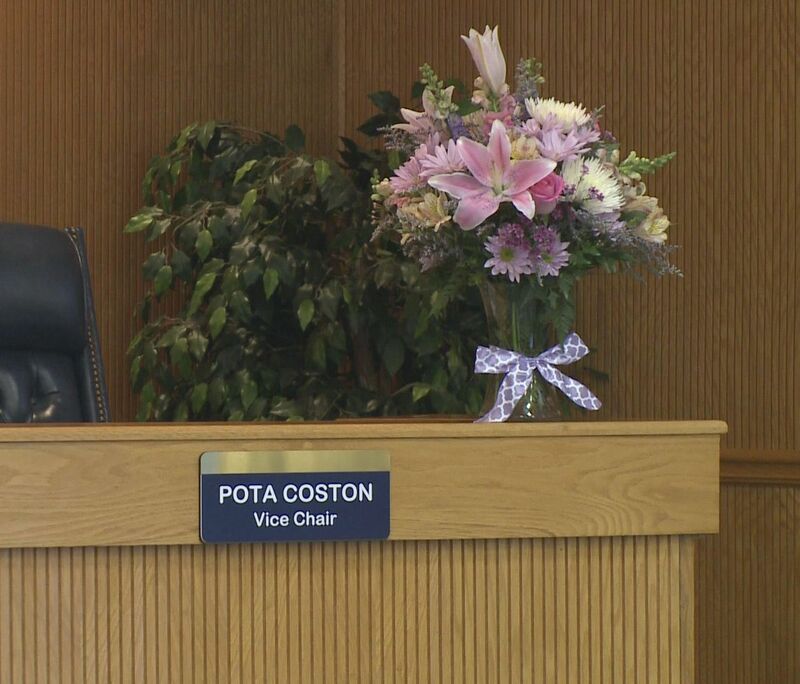 Flowers placed above Coston's seat on the board weren't the only tribute Thursday night. Protest signs called for commissioners to replace her seat in the same way she was elected: with district voting. "I'm in support of district voting because I live in a diverse community ,and I want that diverse community to be reflected in my county commission," said Irene Shane. 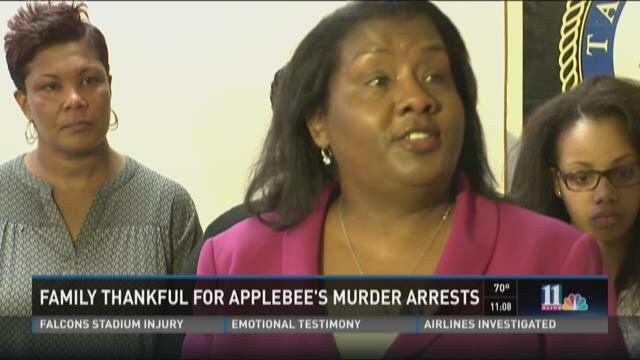 FAYETTEVILLE, Ga. -- Fayetteville Police say a former Applebee's employee was among two suspects arrested for the murder of restaurant manager Greg Smith. Now Smith's family is coming to terms with the kind of closure that doesn't make the pain inside go away. They're seeing Smith's alleged killers behind bars but not getting a chance to see their loved-one ever again. ATLANTA – Authorities have made an arrest in a fatal shooting at a Fayette County pool party. 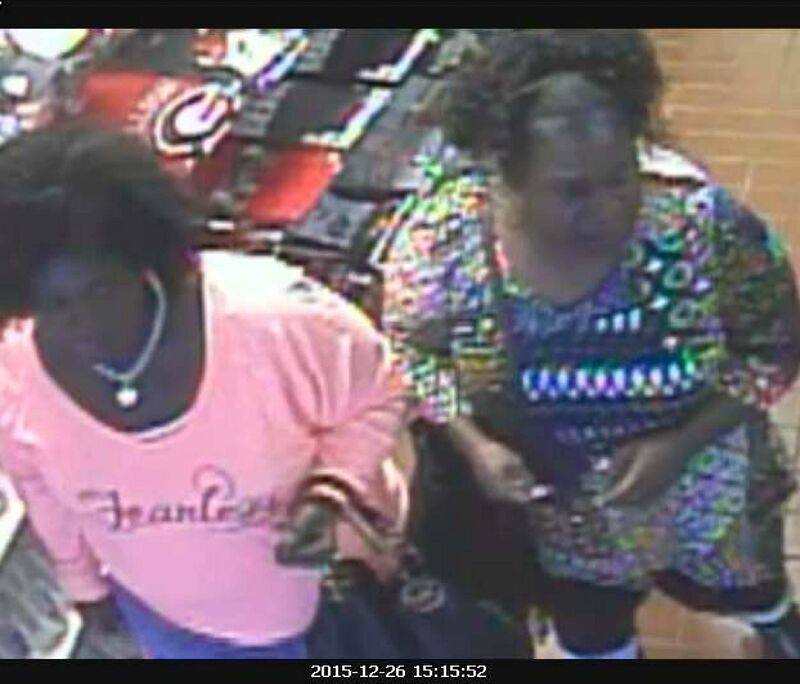 According to Fayette County Sheriff's officials, U.S. Marshals arrested 18-year-old Terrence Kyreef Montgomery Jr. on Friday. Montgomery is charged with murder in connection with the shooting death of 19-year-old Wali Clanton. The shooting happened at a home on Highway 279 on June 13. Police said five people, incluing Clanton, were shot while attending a large outdoor pool party.